"The world must be given back [its[ sacramental quality, its dimension of mystery, . . . such a reorientation . . . would spell the final demise of mechanism as the paradigm of cosmic order." Throughout the twentieth century the "new physics" of Bohr, Planck, Heisenberg, and Shroedinger has been a congenial breeding-ground for mystical philosophies of all description.1 It seems that the door of science is open once again to the idea of levels of being, to ontology and final causation—elements in ancient cosmology that remain perennially valid. This possibility is important not least because of the urgent need to uncover (and treat) the deep roots of the environmental crisis, and to foster in our culture a less aggressive, more harmonious relationship with nature.2 I want to explore here the contribution of Hans Urs von Balthasar to the conception of contemplative science or science of "qualities"—meaning the qualities of the divine nature reflected in creation.3 Although Balthasar thinks that modern science "has its ready-made metaphysics in Aquinas's doctrine of order and relation," he tries to develop Thomism in certain important respects.4 Balthasar's reflections on the Christian Trinity and the drama of divine and human freedom—themselves, of course, neither uncontroversial nor "final"—offer an intriguing vision of a distinctively Christian cosmology. 1. See Quantum Questions: Mystical Writings of the World's Great Physicists, ed. Ken Wilber (Boulder: Shambhala, 1984). Two famous (now "classic") examples of this growing genre are Fritjof Capra's The Tao of Physics (London: Wildwood House, 1975) and Gary Zukav's The Dancing Wu Li Masters (New York: William Morrow, 1979). Antoine Faivre, in Access to Western Hermeticism (Albany: State University of New York Press, 1994), 275-96, concludes that most such speculations fall into pantheism, fail to take account of the Fall, and negate the importance of the human. 2. This has been a consistent theme of Islamic historian of science, S. H. Nasr, from The Encounter of Man and Nature (London: George Allen & Unwin, 1968) to Religion and the Order of Nature (Oxford University Press, 1996). His Gifford Lectures on the need for a recovery of scientia sacra are available as Knowledge and the Sacred (Albany: State University of New York Press, 1993). 3. The following abbreviations will be issued: GL = The Glory of the Lord: A Theological Aesthetics (San Francisco: Ignatius Press, 1982-91), 7 vols; T-D = Theo-Drama: Theological Dramatic Theory (San Francisco: Ignatius Press, 1988-98), 5 vols. 4. 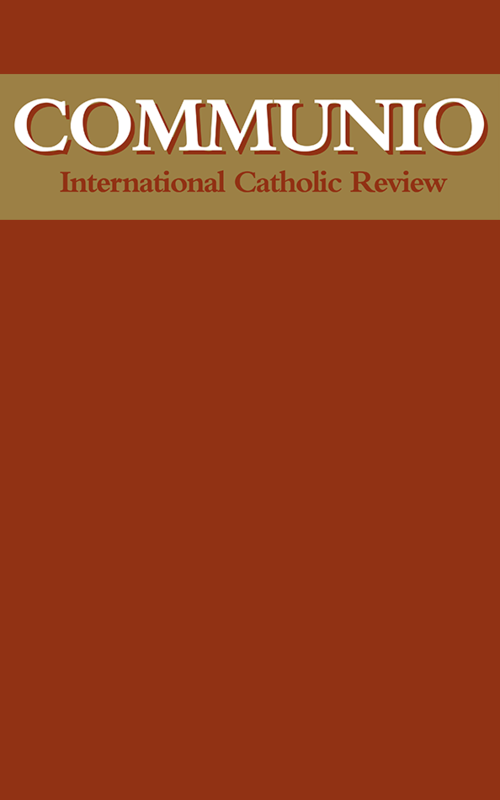 For one view of the differences between Balthasar and Thomas see James M. Buckley, "Balthasar's Use of the Theology of Aquinas," The Thomist 59 (October 1995). Cf. James P. Kow, "The Christian Distinction: The Others," in Communio 20 (Winter 1993). The quotation is from GL, vol. 4, 411. My own reading of Balthasar is indebted to David L. Schindler, Heart of the World, Center of the Church (Grand Rapids: Eerdmans, 1996).